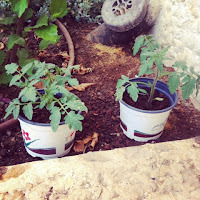 Growing tomatoes is supposed to be very easy, and in my short experience, if you don't forget the watering, it really is. I found a simple youtube video which gives clear guidelines on how to grow tomatoes from seed. I used this Morgan & Thompson youtube video as a guide and made a few modifications. Firstly, I did not invest in packet tomato seeds, and simply used the seeds from overripe baby tomatoes left in my fridge and destined for the trash. I read somewhere that egg cartons make a good starting 'pot' as the water drains through them. 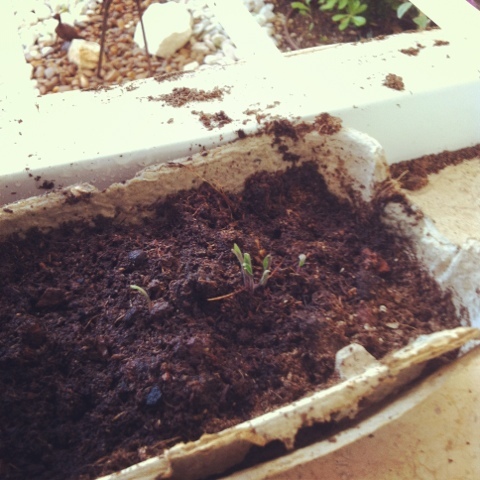 So I took half an egg carton, put it out on my kitchen windowsill and filled it with a nice compost mix (now I have no experience and no idea what makes a GOOD compost mix, so I simply used the only mix that my local garden store sells). I then squeezed out the seeds (pips) from a few baby tomatoes - I actually used many baby tomatoes, on successive days as I didn't really have faith that they would grow. 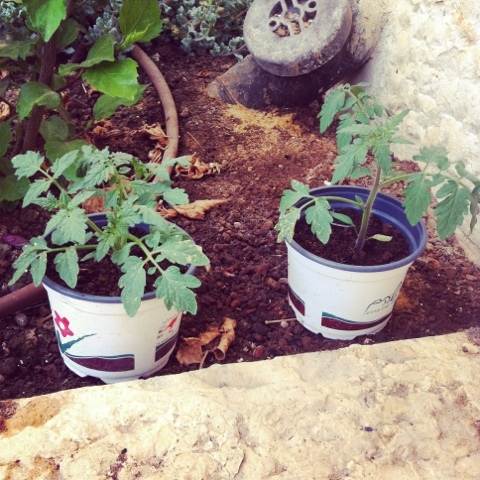 The first time that I tried to grow tomatoes by seed, I didn't water them, and surprisingly, they didn't grow, so this time I was very religious about watering them well every day. And they grew, and grew and grew and grew. It was really fun for the kids (and even more so for me) to watch the tiny germinated seedlings and note the appearance of the cotelydon leaves, and then the true leaves. 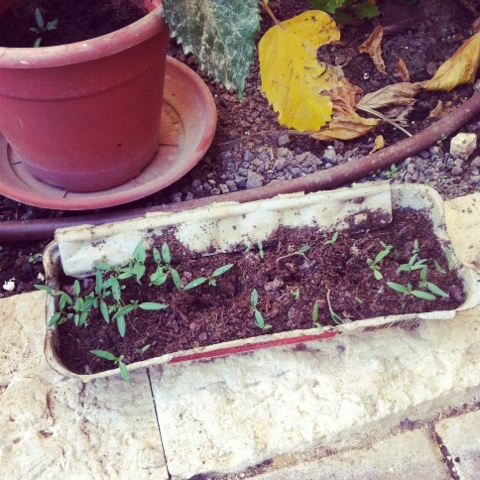 It was almost like my seedlings were acting straight from Renee's Garden's script. After the appearance of the first true leaves, I followed the instructions and transplanted to small pots. My windowsill was full of little pots and I begged friends and family to 'adopt some of my seedlings', new seedlings continued to germinate in the egg carton but for lack of space and 'adoptive families', I had to put them out where they quickly dried out. I've read a lot about hardening off plants that were started from seeds indoors - I'm not sure if a windowsill is considered indoors - but for lack of patience I never hardened off any plants, and simply moved a few of them to a semi-shaded spot on the edge of the garden when I ran out of prime windowsill space. Actually I would say those plants have done the best, so far. Two of those outside plants were designated for my daughters, they each helped to transplant them and water them and it's very exciting as we watch the the plants literally grow from day to day. Today I decided it was time to transplant my kids' tomato plants into their final destination. Here's a video of how I did that. Happy tomato growing everyone, if you have tomato plants too, let me know how they're going, and feel free to leave me tips.